There are examples of common electrical installations that are often found in practical applications where it is required the superposition of the effects. In MAGIC® there is a section dedicated to these situations that can be updated with new or customized types of sources. In particular MAGIC® provides three types of sources: the Joint Bay of HV cable, MV/LV substations and overhead HV power lines. Cast resin transformers, differently from the oil transformers, are not enclosed in a metallic cage that provides a shielding effect. The integral model of the cast resin transformer implemented in MAGIC® makes possible the evaluation of the stray field. The model has two degrees of accuracy that influence the computational time. They are identified in the software by the name “simplified model” and “rigorous model”. When the stray field is computed at one meter from the transformer the two models are equivalent, while when points are very close to the transformer it is recommended to use the “rigorous model”. 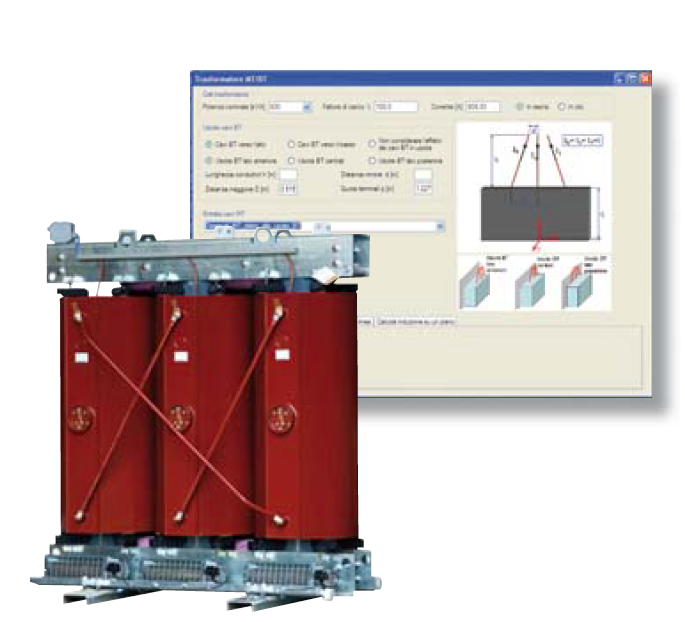 MAGIC® is the only commercial software that currently implements the model of the stray fields of transformers. Depending on the power of the transformers, the software defines the main geometric parameters that allow the operator to calculate the magnetic field without knowing more data besides the rated output power of the transformer. In a joint bay of a HV power lines there are three conductors which are far one from each other even up to one meter. This distance creates an increment of the magnetic flux density that, at rated current, may also exceed 100 μT. Due to this reason the joint bay can be critical and requires magnetic field assessment and further mitigation. The limit of 100 μT is associated with short-term effects and, therefore, must be satisfied at any time, even in places where there may be a short permanence by the general public (ICNIRP requirements). MAGIC® allows the magnetic study of joint bays using a 3D parametric model. The user does not need to build the system geometry but only set the values of the design parameters. Many times it was highlighted the need to be able to calculate the magnetic impact of MV/LV electrical substations. The Italian regulatory framework requires to achieve the quality objective (3 μT), but there are countries like Switzerland where the limits are stricter (1 μT). It is estimated that about 1% of the substations, mainly in civil environment, needs a mitigation action to bring the levels of the magnetic field to the required levels. Since the substations in Europe are estimated to be several millions, one can understand the extent of the issue. The main components of a substation that causes different magnetic impacts on the environment are: MV and LV connections, MV and the LV switchgears and MV/LV transformers. a) Selection between cast resin transformer or oil transformer where the stray field of the transformer is taken into account with a proper model. b) Power lines: MV and LV connections. c) MV panels with in and out cells. d) BT switchgears for the out power delivery. MAGIC® calculates the magnetic field generated by overhead power lines HV, MV or LV. There are no limitations to the geometry of the sources, to the number of power lines, to the arrangement of the conductors. MAGIC® can build a complete 3D model of the sources and can calculate the magnetic field on any 3D inspection plane. The output can be exported as image or in a vectorial format.